What is the requested date of the performance? Include all other pertinent information. If "Other" include what. All fees quoted are for performances within 100 miles of Seattle. Travel beyond 100 miles will incur additional fees. Indoor equestrian events can be held by special arrangement. Inquire about our special Educational Show discounts for schools and libraries! If you are thinking of hiring knights, pirates, or players but not sure what kind of show you might be interested in, here are some suggested examples. A couple of knights available for pictures and characters. A triad of knights fighting for glory and to show their skills. Several knights taking part in a tournament of combat. The grand melee with knights split up into factions competing for their color. Your classic faction tournament – riders and knights split into countries and challenge each other. 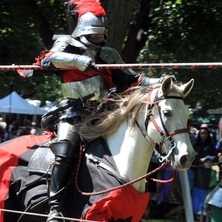 A character show where each knight comes from the legends of King Arthur or Robin Hood. A scripted show with a set story from the world of Tir na n'Og, revealed throughout the course of the tourney. A couple of pirates available for pictures and characters. Several pirates fighting to settle disputes and to show their skills. A small group of pirates run some children's games and compete in a fight circle. The grand melee with lots of pirates running all the children's games and competing for gold and glory in a large fight circle. Several players fighting to show their skills and settle disagreements. Players perform one play with lots of combat. Players perform one combat-filled play multiple times throughout the day. Players perform multiple combat heavy plays throughout the day.